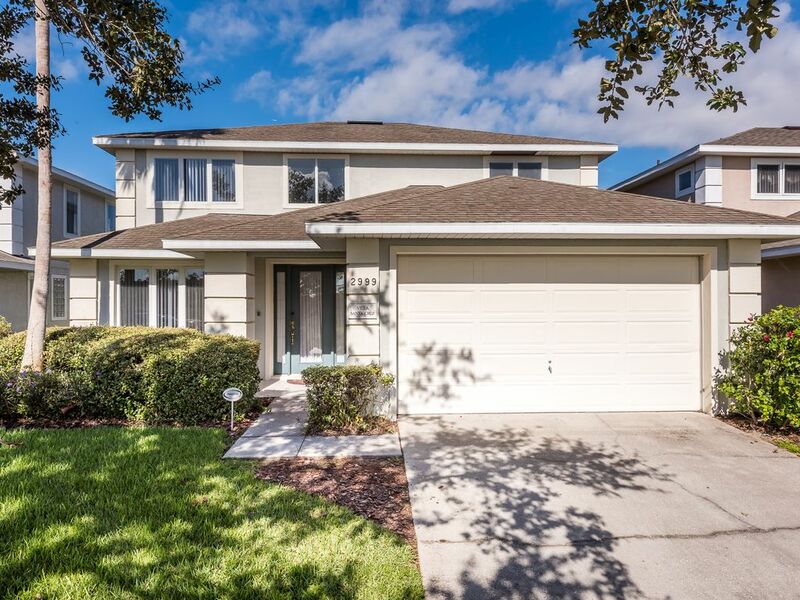 Our Florida Villa really is a true 'home from home' offering all the benefits of staying in a private home in air-conditioned comfort while being close to all the action of the Orlando and Disney theme parks. BEDROOMS FOR EVERYONE - The larger than average home boasts Two large master suites, so two families are able to stay together - making a great value vacation compared hotel suites. Both master suites offer spacious king size beds, spectacular en-suite bathrooms and one even has it's own private sunbathing balcony with stunning lake views. CHILDRENS ROOMS - The further bedrooms at Villa Santa Cruz inlcude a Queen double as well as two themed twin bedrooms, one with a pretty Disney theme and the other fit for your Marvel Super Heroes. SPACIOUS ACCOMMODATION - Villa Santa Cruz is light, airy, open plan and spacious. Our home gives everyone the space they need on vacation and can easily accommodate 10/12 guests. EXTRA TOUCHES - We have worked hard to provide all the little touches and upgrades that you would wish for on a luxury vacation. These include the private Lakeview Pool with shaded lanai plus a luxurious separate hot tub and plenty of lounging and outdoor eating furniture. Plus, the games room at Villa Santa Cruz has the option of air-conditioning which is essential in the summer months. Our cosy games Den has cable TV and a Playstation - perfect for some privacy and relaxation. The whole family will also love the living areas which have and free WiFi access. The open plan living areas boast a light and airy Dining room with lake views, a Family room with 55" cable TV with 'on demand'. The fully equipped Kitchen has a Breakfast Bar and is open to the dining and family areas - no need for the cook to be left out here! The accommodation is further enhanced by the Utility room boasting an American sized washing machine and tumble dryer. There is also a Games room which has a Pool table and Basketball Challenge. The Games Room also has the added benefit of air conditioning. The front of Villa Santa Cruz overlooks peaceful conservation land while to the rear there is a private Lanai and Swimming pool with optional chargeable heating for those chilly winter months. A separate luxury hot tub caters for those tired muscles after a long day at the attractions, and the lanai is a wonderful setting for dining al fresco which offers stunning views westward over the sparkling lake - perfect for a relaxing siesta from the hustle and bustle of the theme parks. Sunset Lakes is a gated secure community and is one of Kissimmee's most popular developments combining tranquil surroundings and a beautiful Lake with close proximity to Golf courses, Shopping, Restaurants and easy access to all the exciting attractions of the Orlando area. Games Room, Den with Playstation 2, Barbeque, Air-Conditioning, Iron and Board, Washing Machine, Tumble Dryer, Microwave, Coffee Maker, Blender, Toaster, Fridge/Freezer, Ice Maker, Dishwasher, Waste Disposal, Cable TV & VCR, Heated Swimming Pool, Credit Card Telephone with free WiFi Internet Access, Community Pool and Children's Play Area. BR B Area: /B BR Sunset Lakes is located just off the Highway 192 west of Disney. Highway 192 offers Supermarkets, Shopping, Restaurants and Bars. Access to Disney theme parks is less than 5 miles away. Gulf Coast Beaches, Busch Gardens, Universal Escape, Seaworld and Kennedy Space Center are all easily accessible via the I4 located 4 miles east. We are Jorge and Sue Fernandes and we love to visit our home in Florida. We live in Stockport, which is in the north of England and work in the Hotel industry, running a family business. Our business takes up a lot of our time, but when we are not working we love to spend time with our two daughters and plan our Florida holidays. While in Florida we work hard to ensure that our home is a true 'home from home' and is somewhere we love to spend time with our family - we hope that you will too. Our love affair with Florida started in 1994 on our first visit. From then on we were hooked, and were regular Hotel visitors until 2002 when we bought our dream home at Sunset Lakes. As soon as we stepped foot in our villa and looked over the lake views to the back we knew this was the one. The layout, location and size of our home just made so much sense to us, and gave us the space we needed to visit with our extended family and friends. Since then we have enjoyed many wonderful vacations with our growing family and we visit Sunset Lakes at least once a year. On every visit we spend a lot of time on each visit making sure that our home is kept to the highest standards. We are also lucky to have a great local management team who are on hand for our guests needs. The location of Sunset Lakes is one of the major benefits of our home as it is just 1 mile from the bustling 192 highway which has a large range of entertainment, restaurants, bars and shops. Disney is also on the doorstep, along with access to all the other Florida attractions via the nearby Interstate 4. Sunset Lakes is a rare gem amongst the large rental estates in the area. Set around two lakes the community has just 160 homes and is surrounded by conservation land, giving it a small, rural feel while being just a mile from the Highway 192 and the Disney parks beyond. What do we love about Villa Santa Cruz? Being close enough to the parks to come home to recharge our batteries before heading back out for more fun! Being able to sit in the sun while taking in the stunning views of Sunset Lake Being able to soak away our aches and pains in the hot tub. Listening to the local wildlife, and fishing in the Lake Our teenage daughter especially loves having her own huge Master suite and en-suite bathroom! We love having a little peace and quiet while the kids are enjoying themselves in the games room. But most of all, we enjoy the fact that we can all spend our vacation time together in a place that we love. All bathrooms come with plenty of towels and linens plus hairdryers for the master suites. Sunset Lakes offers facilities including a 'Tot Lot' childrens play area and swimming pool. Your vacation time is too precious to waste on travel so Sunset Lakes is located just minutes from Disney! The swimming pool and hot tub at Villa Santa Cruz has an amazing view over larger of the two lakes at Sunset Lakes. Perfect for viewing the fabulous Florida sunsets. Two families totaling seven stayed here for ten nights. The house is comfortable and roomy along with having a great pool with above ground hot tub. Your access to all the parks is perfect. Gated community. This house will make your holiday complete. FYI eat at Bruno’s!! The house was beautiful. It was so well taken care of, it looked brand new. Kids loved the pool and we played pool and basketball every day. The only downside was that we paid for 6 days of pool heat but the fifth day the heat stopped. The pool got pretty cold but that was no reflection on the house at all. I would definitely rent this hpuse again and recommend it to others. Thanks again for letting us live like royalty for a week. Thankyou Nichola, so pleased you had a great holiday. Please keep us in mind for your next Florida vacation. Great location. Everything you need. Great time the identical villa across the lake cost twice as much that one had new bathrooms and new decor. This one had all we needed and left us loads of money to spend. The owners are very responsive answered every question as well as arranging a late check out. Hot tub welcome after miles in parks. I would book again. Why waste your precious time in the car? Stay somewhere right in the heart of all the main attractions that Florida has to offer. With the bustling highway 192 just minutes from our doorstep, a huge range of restaurants, bars, activities, golf and shopping options are available within easy reach. Sunset Lakes is just 4 miles from Disney World, it's 4 major Theme Parks are the best in the world - Magic Kingdom, Animal Kingdom, Epcot and Hollywood Studios can easily be reached in minutes from Sunset Lakes. Disney also boasts world class Golf Courses, plus two convenient Water Parks, Blizzard Beach and Typhoon Lagoon as well as huge Disney Springs themed shopping and eating venue. All on your doorstep when you stay at Villa Santa Cruz. We are also just 17 miles from Universal Studios and Islands of Adventure, featuring Harry Potter World as well as just 15 miles from Seaworld and Aquatica, along with the unique Dolphin attractions at Discovery Cove and all the attractions of International Drive, including Madam Tussauds, the Sealife Center and the Orlando Eye. Want to head for the Beach? - its easy from Sunset Lakes. Just jump on the I4 and head east or west to either the Gulf coast or Atlantic coast. Superb beaches await you in either direction. And if you are combining your stay in Orlando with a cruise or Beach stay it couldn't be more convenient!